In the wake of World War One, two New Zealand soldiers who had served in Palestine recognised the need for an efficient overland transport service between Mesopotamia and the Mediterranean. The brothers, Gerald and Norman Nairn, founded the Nairn Transport Company in 1923. Their area of operations was the vast Syrian Desert, with passenger, freight and mail services offered between Baghdad in Iraq and Haifa in Palestine. The route passed through Beirut in Lebanon and Damascus is Syria. The administrations of Palestine, Lebanon, Syria and Iraq welcomed the brothers’ company with enthusiasm, and after successful runs with passenger coaches between Baghdad and Beirut, postal contracts were signed. Nairn Transport Company provided acceptance of mail at their offices, as well as collection of mail from departure post offices and delivery to the post office upon arrival at the destination. Nairn’s charges for these services were paid by affixing additional postage stamps to envelopes. The four countries in which Nairn’s operated agreed that additional postage should be charged for the overland service. These charges were abolished for letters in 1929, but continued for parcels. The weekly service commenced in October 1923, and the earliest known date for a cover is 23rd October 1923. 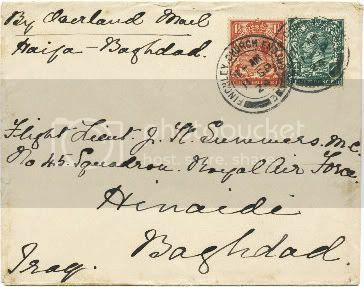 In Iraq postage for an ordinary foreign letter was normally 3 annas, whereas a letter routed via overland mail Baghdad-Haifa required 6 annas. In Palestine postage and overland mail fee amounted to 13 mils. Postal authorities outside the four countries serviced by Nairn’s also charged additional postage. The cover above has 5½d. prepaid, which was the correct franking for a letter under 1 oz. The UK foreign letter rate up to 1 oz. was 2½d. and the surcharge for use of the overland mail was 3d. It was postmarked in Great Britain on 11 September 1924 with arrival backstamp in Baghdad on 20 September 1924. The cover is also correctly inscribed in manuscript with the accepted wording 'By Overland Mail Haifa-Baghdad'. The first vehicles used by the brothers were 75 hp buses imported from the United States. The vehicles were luxuriously appointed for the long journey over the desert. They were later fitted with steel plate and iron bars. This was to provide protection for passengers from bandits and snipers who had proven troublesome to the service. From 1927 the buses were replaced by large six-wheeled luxury coaches. By 1933 the political circumstances in the Middle East had changed considerably. Growing movements for full independence, particularly in Iraq and Syria, saw the postal administrations of these countries cancel their contracts with the Nairns. By the end of 1934 the overland mail had ceased, although this had little impact on the company as their passenger business continued to grow. I collect the Overland Mail Baghdad - Haifa and on my Web Site your will find much additional information related to the history and postal service in addition to articles posted. A blog dedicated to British Empire and British Commonwealth philately.